Stairmasters and bicep curls are not just for adults anymore. Some schools have opened fitness rooms where students exercise and track their progress. Students enthusiasm is drawing in parents and community members as well. Included: Fitness rooms in action. Composting: Reduce Waste, Recycle, and Teach Green Habits in One Fell "Scoop"
Spend a little time in your school's cafeteria, and you may be startled by the amount of food that students are not eating. Rejected scraps are wasteful and fill up garbage cans. Composting takes those scraps and puts them to good use. Can it take root in your school? While looking for ways to raise money without spending money, a retired teacher heard about a spell-a-thon at another school and brought the idea to her former colleagues. Pledges students earned for correctly-spelled words yielded $15,000 for the school. When Dr. Yvonne Sanders-Butler was appointed principal, she knew she had a responsibility to change the way students were eating. Poor nutrition was impacting their academic performance and behavior, and she knew good nutrition could improve those things. College Days at three elementary schools aim to get all students thinking about their futures. Whether the day involves guest speakers, visits to campus, or college courses taught by familiar teachers, the goal is to inspire kids to see themselves as college-bound. Last year, more than 8,000 schools participated in Mix It Up at Lunch Day, an event in which students gain new understandings -- and friends -- by eating with kids with whom they might not otherwise connect. Included: Three schools Mix It Up experiences. Dogs in the classroom can be used to calm fears, relieve anxiety, and teach skills. Meet Morgan, Sadie, and Lucky, three dogs that are teaching students and their teachers lessons theyll carry all their lives. Included: Eighteen lessons learned from dogs. "Career day" and "career fair" events arent just for high school. Exposing kids of all ages to the world of work can broaden their perspectives. Included: Tips to creating a successful career day at the elementary or middle school levels. Have a goal for the students in your school? At your disposal is one of the most desirable and inexpensive incentives you might hope to find -- your job! As an auction item or reward, nothing can motivate kids more than to be your schools "Principal for a Day." A service-learning course led students at one school to develop a secondhand store that provides a community service, donates funds to charities, and even brings shoppers to struggling businesses nearby. Plus, it teaches students business and other skills. Troubled by the lack of direction shown by seniors, staff members at one school decided to give them an experience that might give them some focus. The surprising outcomes for students and the surrounding community have impressed school staff and parents alike. Integrating a fitness and nutrition program into everyday lessons helped some elementary students tone up and prepare for a competition. On the way to the contest, students learned more about healthful eating, lost weight, and improved their test scores. Many communities are coming to the aid of their schools by setting up educational foundations that channel private donations toward specific schools or programs. Included: Foundation directors share tips for getting a new foundation off the ground. With student fitness levels dropping and recess scuffles escalating, one school started a 100 Mile Club to improve student fitness and focus, and to provide some structure at recess. Students walk at least a half-mile daily to meet the goal of completing 100 miles. Numerous school districts use the Principal for a Day experience to connect with businesses and community leaders for a few hours once a year. But many of those experiences turn into lasting partnerships that strengthen the school community and benefit students. Do you find it difficult to maintain a strong and healthy bond between your school and the community? This is just what the National Association of Elementary School Principals hopes to foster with its "Sharing the Dream" grant competition. You may be surprised to learn of a program that requires little effort and capitalizes on something everyone in your school community is already doing -- searching the Internet. GoodSearch, a search engine powered by Yahoo!, donates revenue to participating schools. As budgets stretch to the breaking point, public schools are discovering the powerful fundraising possibilities of the auction with a technological twist. The flexibility, convenience, and popularity of online auctions enable schools to tap a limitless base of supporters. Facing grade books filled with zeros, some teachers have decided that they simply won't accept incomplete assignments or "zeros." They have created programs that get the work done and improve students grades and self-confidence. Included: Three approaches that work. Spring open house showcases students accomplishments, draws big crowds. Many elementary classes start each morning with a meeting, but more and more middle school teachers are realizing that their students crave the community and camaraderie of the morning meeting too. Included: Four components of a morning meeting. PTA Take Your Family to School Week is just one of the PTA programs revitalizing parent involvement in education. This special week in February is easy to implement too, with these ten ideas and the PTAs online guide and poster. Don’t miss this opportunity for your school to connect with the community during Super Bowl week. Each year, the Souper Bowl of Caring involves students as they collect millions of pounds of food to benefit local organizations. Participation tips included. Driven by the desire to enhance literacy skills and bring together generations, these three schools organized One Book community reading activities. Is this something your school might do? Included: Tips for choosing the right literary selection for a community read. Students who are disruptive, can't concentrate, or lack motivation may not need a firm hand; they might, instead, need a helping hand. Principals in many states have initiated programs that fill backpacks with food to help kids get the fuel they need to flourish. There is no time like the present to begin planning your school's best commencement ever. This year, take a page from the book of higher learning and recognize not just the graduates but the elementary and middle school educators who helped get them there. Carle, Cleary, Rowling, and [Your Students' Names Here]: Kids Can Be Published Authors, Too! Kids of all ages can be encouraged to write when they know that their work will be returned in the form of a published book. Learn how to get started with book-writing projects for whole schools or individual classes. Students choosing to read meaningful literature and avid readers from different schools working together as teams: does it sound too good to be true? America's "Battle of the Books" combines literature and friendly competition. Start a "battle" at your school! Every school wants to foster a love of reading in students, but how can schools fit another reading activity into a packed educational day? Some schools are inviting kids to join in book discussions as they eat breakfast. Included: How to organize a breakfast book club. Tight-lipped kids often keep their parents in the dark about school activities. How can schools bring them out of the cold? Invite them in! "Parent Visitation Days" are easy to organize and a great way to get parents in touch with their kids' school life. Schools are discovering the benefits of cutting down on the waste they produce, particularly in the lunchroom. In addition to monetary benefits, the schools are producing stewards of the Earth. Included: Simple ways to reduce waste in the lunchroom. One Mississippi middle school is offering parents the chance to answer questions from its state tests, to help them understand what their children face. Included: Description of a test information night for parents. Attendance at homework clubs soon could rival the turnout for more traditional afterschool offerings. The clubs give students the help and structure they need to complete assignments. Included: Tips for organizing a homework club in your school. While students at one Connecticut elementary school learn the "ropes" of respect, middle schoolers in California are making community service part of the curriculum. Both schools received special awards for their programs. Included: Community service tips. Some schools are offering workshops and seminars through what is termed "Parent University" to help parents better understand and deal with kids. Parents are going "back to school" -- sometimes with their children -- as an investment in them and the community. A lack of maintenance and funding had taken a toll on Baltimore, Maryland's schools. A call to the community for help this summer, though, yielded donations and thousands of volunteers who completed hundreds of thousands of dollars of work -- and are still at it. Schools are capitalizing on the popularity of the TV program Survivor by establishing their own competitions to promote community spirit and teamwork. Should your school host a sequel to "Survivor"? Included: Ideas for starting your own program. Inviting parents and pre-kindergartners to meet teachers and see their schools six months before school opens can noticeably reduce first-day jitters -- for everyone. Called kindergarten round-ups, these events also let teachers meet their incoming charges. This "local shop" can stock merchandise ranging from pencils to tasty snacks, and sell its wares to students, teachers, principals and even the occasional visitor. A school store, however, is more than a "convenience store;" its shelves also are stocked with the materials for building academic and lifelong learning skills. Halting the trend toward child obesity is a challenge, but some schools are meeting it with more than food that is nutritionally balanced. Included: Learn about three school nutrition programs that are working. Buying in bulk may be standard operating procedure for some companies and families, but what about school districts? Two Wisconsin districts have started sharing purchasing and ideas about saving time and money, and administrators hope the idea spreads to other school systems. Many schools are using collected data to drive change. Test scores are analyzed and used to lead curriculum improvement. Survey instruments provide feedback from students, staff, parents, and the community that lead to change too. And data can be used to group students and to assign teachers with proven skills to teach specific student groups. Those are just a few of the ways in which Education Worlds Principal Files principals are using data to lead their schools to success. Could Four-Day Weeks Work for You? Some school districts looking to save time and money have switched to four-day school weeks, either leaving the fifth day free or available for tutoring and parent conferences. Although some superintendents favor the concentrated class time, some say the wear and tear from a longer day has not been worth it for staff or students. High Notes, Hayrides, and Hot Dogs: Making Open House a Hit! With so many parents and children leading very busy lives, schools need to do more than simply open their doors during open house activities; they need to draw families inside! Through games, food, student performances, extra-credit points, and more, schools are turning open house into a must-see event. How can you make open house hip and happening to improve attendance and parent-teacher cooperation? Fab Friday: Fun and Games That Make a Difference! Three Fridays each year, Freeport (Maine) Middle School closes its textbooks and opens its doors to a different kind of learning. Students and teachers share exciting "Fab Friday" hobbies and activities and in the process learn to see one another in a whole new light. Education World writer Leslie Bulion talks with Freeport Middle School staff and students about why Fab Friday is more than just fun and games. Although people often use the terms cellular and wireless interchangeably when they talk about phones, the two are different. A wireless phone system that has no monthly charges and works only on school grounds is becoming popular with certain school systems. Education World chats with school leaders in districts that have adopted wireless phone technology. Cracking down on truancy is a growing concern for many administrators, as requirements increase and evidence mounts that children who are in school consistently learn more than students who are absent. Education World talked with administrators in several districts who use everything from fines to rewards to keep kids in school. Principal Les Potter looks back on his years at an inner-city school that adopted the Paideia approach to teaching and learning. In these days of high standards, accountability, and a focus on student achievement, Potter says, Paideia is an approach that warrants consideration. High school kids in Wildwood, New Jersey, don't have to make it to the pros to make it onto a trading card! Good grades, good character, and community and school service can get their photo and statistics on a trading card -- which are given as rewards to elementary and middle school students. Young kids who earn five cards get a free lunch. School Book Club Gets Kids and Adults Involved! Parents at Northwood Elementary get involved in school academics by participating in a school book club that promotes fun and a love of reading. Included are tips for starting a book club in your school plus resources that describe the benefits of reading! Parents Step Into Students' Sneakers for a Day! Here's one school's approach to increasing parents' involvement in their students' education: send Mom and Dad back to school! Parents who spend a day walking in their children's footsteps at Central Middle School develop a new appreciation for the rigors of middle school, according to principal Tara Fair. Contrary to what some people might think, the kids are glad their parents are there! Many school districts have established successful teacher home visit programs. Home visitations by teachers get parents involved in their child's education -- and they let parents and children know how much teachers care. Education World writer Sherril Steele-Carlin talks with administrators about how home visit programs work. Good first impressions make a difference, and the first open house of the school year gives administrators and teachers a chance to gain parents' support. It also provides an opportunity to create a personal connection with parents and establish ways for continued communication throughout the school year. In Sacramento, California, an unusual alliance between the school district, a zoo, and the National Guard has resulted in a successful program that encourages fifth graders to come to school and behave well. The reward for their hard work is an overnight excursion to the Sacramento Zoo where they watch animals, play games, and enjoy a pancake breakfast! Could a similar program be implemented in your area? Do You Know Your Students' 'True Colors'? Using True Colors, teachers, coaches, and administrators can learn about their personality types as well as those of their students and colleagues. This strategy shows teachers how they can base lessons and teaching styles on students' needs, one school principal tells Education World. "We have never tried to educate everyone until recently," he says, and True Colors helps do that. True Colors can also help students understand teachers and help teachers work better with one another. Two urban school districts -- Rochester, New York, and Chicago, Illinois -- are launching programs this fall that will allow students to graduate from high school in three, four, or five years. The five-year program was introduced as a way to help students who might have trouble graduating in the traditional four years to experience success rather than failure. The program allows students who have difficulty with certain courses, such as math or science, to complete them over a year and a half or two years instead of one. Awards Programs for Teachers -- Giving Credit Where It Is Overdue! Great teachers deserve great rewards, and nothing is more effective than praise and recognition in the form of a national award. Many organizations and companies around the country offer such commendations because they recognize the value of excellent educators. With a little time and effort, your multi-talented, innovative staff can be award winning as well! Students often know about the threat of violence in a school -- even when administrators and teachers are in the dark. Yet fear of reprisal or being labeled a snitch may keep students silent. Programs that provide anonymity to students and others reporting crime, violence, or the threat of violence can help make our schools safer places for learning. But, administrators caution, such programs are just one piece of an effort to make schools safer places. Included: Education World talks with administrators who use online violence reporting programs in their schools. The research is clear: When parents and communities are involved in schools, education improves. From New York to California, from an individual student's notebook to community-outreach programs, here are five approaches to parental and community involvement that work! Included: Five successful programs for parent and community involvement plus links to dozens of online resources! Playground Pass Creates Recess Success! If you've done recess duty, you know the playground is not all fun and games! Wouldn't you love a simple, straightforward teaching tool that steers students away from trouble and into recess success? The Playground Pass does just that! Built on sound behavior principles, it's a system that classroom teachers and playground monitors can use together to help kids make positive choices during free play. Included: Links to the reproducible Playground Pass system and other free resources! Bringing Families and Schools Together-- FAST! Since its creation 12 years ago, Families and Schools Together (FAST) has received more than two dozen awards and is recognized as one of the most effective parent-involvement programs in the country. FAST brings together families to support one another and to prevent potential problems-- school failure, violence, and substance abuse, to name just three-- before they start. Research indicates that FAST works in schools of all kinds, from urban to rural. What is FAST? This week Education World explores the program. Whether a comprehensive high school, a magnet school, a small pilot school, or a restructured vocational-technical school --- the Department of Education's 30 "New American High Schools" have been transformed by research-based reform strategies. This week in Education World, Bob Kemmery and Sandra Foster --administrators from two of the newest New American High Schools-- share their views about the keys to high school reform success. Included: Ten "New American High School Reform Strategies," with online resources to help educators put those reforms to work for their own students. What older children do after school when parents are working has been, and is, a knotty problem that government and private sources are working hard to solve. In Boston and in other communities, after-school programs provide great benefits to students and to the communities the programs serve. Included: What makes an after-school program successful? This week, Education World takes a look at some special programs that target at-risk students in grades five and up. In this overview, we examine school programs for students with problems, programs for "average" kids who've gotten lost in the shuffle, and a controversial preventative program. What makes these special programs successful? Can anything be learned from these programs that might be adapted by "mainstream" schools? Included: Additional resources for educators interested in learning about or developing programs that target at-risk students across the grades! What Makes "Success for All" So Successful? More than 1,100 schools nationwide have chosen the Success for All program as their key to academic achievement. What makes Success for All so popular with so many educators? How can middle school students achieve greater success? The Southern Regional Education Board offers a plan -- a plan that provides food-for-thought for all middle level educators. Included: Suggestions for developing "high expectations classrooms." Math Education in the U.S., Germany, and Japan: What Can We Learn from This? A recent study compared the videotaped teaching styles of 81 eighth-grade math teachers in the U.S. with those of teachers in Germany and Japan. What did educators learn from the study? 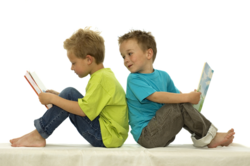 Simple Things You Can Do to Help All Children Read Well and Independently by the End of Third Grade is a new booklet from the U.S. Department of Education. The booklet provides ideas for involving community groups, local companies and universities, the media, and others in achieving your school's reading goals. 101 Ways Parents Can Help Students Achieve, a booklet from the American Association of School Administrators, is a valuable tool for principals, teachers, and parents. A special Earning By Learning program sponsored by the Houston Automobile Dealers Association is gaining attention as a model of school-business partnership.